Islamabad would not be closed down but nation would see an end to politics of Pakistan Tehrik e Insaaf (PTI) on November 2.
laptops among students under Prime Minister’s scheme here at Government College University (GCU). in the country and ballot was the only way to bring a positive “change”, citing PML N had secured enormous public mandate in all bye elections, which was again ample proof of their confidence over PML N leadership and its government. were now hell bent on grabbing powers forcefully”, he added. held accountable on the basis of any of the Panama allegations leveled by the opponents, asserting that Imran Khan, who also owned offshore companies, must not become jury to take decision on his own and declare anyone unlawful on mere allegations. If PTI had any solid evidence, it must present it in the court of law, he added. 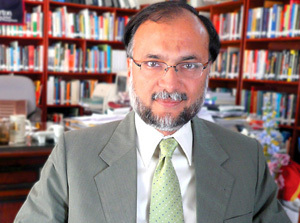 Ahsan said that Prime Minister Muhammad Nawaz Sharif always respected the judiciary and the Constitution, adding other political parties must show same spirit and let the court decide that matter. of sit in and protests tantamount to exerting undue pressure in this regard. was not democracy but anarchy. PTI must take its reservation on the floor of the parliament and wait for the Supreme Court verdict, he added. peace and putting the country’s economy on strong footings was agenda of PML N government. for the sake of politics and focusing only on improving country’s economic competitiveness in the world. China Pakistan Economic Corridor (CPEC) was the gift of nature that offered great opportunities for every sector of economy, as it would make Pakistan centre of trade and commerce in the region of three billion population,he said. critical areas and sectors which were pressing challenges in 2013, adding,”By the grace of God, it has made great progress. Today Pakistan has turned the tide on positive and upward trajectory and that is what has given them hope and inspiration for a better future”. terrorists were on the offensive. But today,the state is on the offensive and they (terrorists) are hiding and running to find refuge but they can’t find any refuge,he said. three years ago, he said,adding,”We will not rest until we make our country fully safe and secure in all respects”.